As I'm sure you know, the major-chain Borders recently filed for Chapter 11. Bankruptcy. AHH!!!!! I was uber-sad when I heard this, and then uber-happy when I found out my Borders wasn't going to close. Usually, when a store goes out of business, I often ask myself: Well... how often did you actually go there? But with Borders the answer is: a lot. It's the only physical bookstore where I buy books because they have coupons, and I'm a starving college student. However, even though I do go to Borders, the books I order there are FAR outnumbered by the books I order online. I'm an Amazon-addict. They're prices are always great, I get free two day shipping, and it makes it easy to pre-order! And so I have been feeling a little guilty (which will become blatantly obvious if you read this entire post). 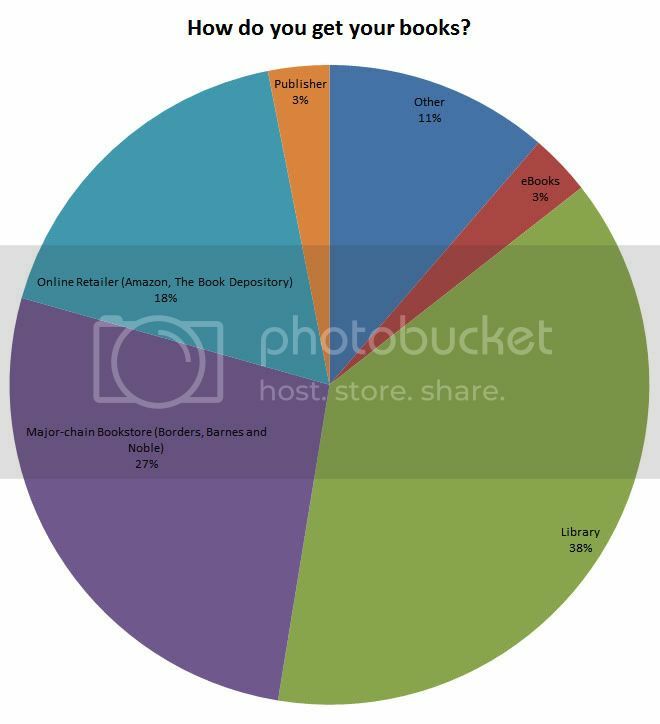 Up above I posted the results of the survey I did a few weeks ago, where 27% of you say that you get the majority of your books from a major-chain bookstore. Compared to the 18% who buy them online. This gives me hope. Maybe so long as there are more of you than there are of me, bookstores will still survive. I really hope so. Because even though this whole crisis did inspire me to run to my local Borders and buy a book, I still will buy the majority of my books online. It was actually Shannon Hale's post on the whole issue that made me want to run out to a store. I totally agree with her. I really don't want bookstores to go out of business. I LOVE the bookstore atmosphere. And it's bookstores that host all the fabulous author-events I go to. However, I do prefer online ordering. It's the sad truth. If faced with the choice between keeping Amazon in business and keeping Borders in business, I'd choose Amazon. I'm a patron of both, and I certainly won't ever stop going to bookstores, but when it comes to price they just can't compete. Maybe someday when I'm a millionaire high-school teacher (ha!) then I'll be able to afford paying full price for a book, then I'll have a road trip where I visit all the bookstores (indy and chain) all around my area. Until then, though, I'm going to go for cheapness and ease. All right. Now I don't blame you for giving an indignant scoff and unfollowing my blog. I know the blogging community is full of bookstore-only purists lately. Hopefully you understand my viewpoint, though. I know that bookstores bring jobs to a community. I know that they are a wonderful resource to the community. And I love all those things. However, brick-and-mortar isn't cheap! And myself, and nearly everyone I interact with, can't afford to pay for those bonuses, we just want books. I totally began this post in support of bookstores. But the more I think about it... the more I'm afraid that bookstores may just be out of luck. I would feel so, so, so, devastated if Borders of B&N ever went completely under. But would my life be completely altered? No. Not so long as I have Amazon. And so, I open myself up to your comments. This post didn't go the way I thought it would, but at least I'm still honest. Oh. And just to add one more nail, I'd like to end by saying I really dislike eBooks (which Borders has kinda said is what drove them under). But that's a story for a different time. I don't think it makes you a horrible person! Of course, I use Amazon for pretty much all my books (plus I'm getting a Kindle tomorrow) and so I can't really say otherwise. I personally think this may be a great opportunity for independent bookstores. After all, Borders (and other large chain stores) were/are partially the reason why many had to close. So I don't think we should feel too sad for Borders, even though it was the store I went to most. Ordering only will never replace the feel and excitement of visiting a bookstore but at the end of the day, the price ends up being the most important thing to me. When you know you can get a book for half the price online, it's hard to resist. It seems like all the Borders around here are closing. But I never really went there anyway. We generally end up with Barnes & Noble GCs at Christmas and it is right at the mall so if we go to a bookstore that is it. Plus I get Amazon.com GCs all the time through Swagbucks so we do a lot of shopping there. It is really hard to pay full price at a regular bookstore when you know you can get the book cheaper online. I buy my books from an odd combination of places. I buy a few from Costco. I'll buy books for signings from where the signing is, which is most often The King's English. But I think the majority of my books come from B&N online. I think I've bought something off of Amazon maybe 3 times. Its just not my favorite. As much as I loved the feel of being in Borders because it had a cozy inviting feel to it, full price is too much for me to pay if I don't have to, so I go for cheap. Costco & B&N online are about the same & I get free shipping from B&N. If TKE or B&N ever closed, I'd be devastated. I mostly buy my books from Book Depository. I hate that it takes longer for stuff to get here, but I can't justify spending more money in person when I could get something cheaper, tax free, and free shipping. Maybe I sound really crazy and/or traitorous, but I don't really see the need for that many in person bookstores. I feel like the library is really the centre of a community, and it's a great place for author events as well. Indie bookstores are a different story, but chain bookstores? I don't feel much loyalty to them at all. Oh, I forgot to mention ebooks. I hate reading a whole book on my computer. If I'm editing a friend's story, I'll print it off to read it. not a fan of not paper reading. The Book Depository is great for international shipping since I have non-US friends, but I've not used it to order any books for myself. I am still upset about the Borders thing too. My main store didn't close which made me happy because I am always shopping there because of their rewards program with coupons. I like Amazon, but 99% or maybe 95% of the books I buy are Mass Market PB, so I can get one on sale w/a coupon at Borders while at Amazon, I can do no such thing. Which is why I only go to Amazon for hardbacks or other hard to find books. But for the most part I am Borders all the way. True, not all of their hardbacks are always on sale, but with their coupons I can get a deal. Amazon has deals for hardbacks but not so much MM PB. And I'm not too trusting of buying used copies online there either. I had bad experiences buying used DVDs there--totally different I know, but still. Hopefully Borders will be able to pull themselves together. I have a Kindle as well, but I still rarely buy ebooks because really the costs are the same at regular price! So I can pay 6.99 for a MM PB or use a coupon on 7.99 and just have another book to add to my shelf. In the long run I will still be doing this method of shopping for my books, but may use my Kindle to get some hardbacks if the deal is good enough! Unless I'm buying my non-fiction books, I'm barely able to shop at Borders. Their YA section is almost non-existent (2 aisles, barely stocked), urban fantasy is mixed with horror and they're almost always out of at least some of the books in a series. They never have a complete collection of anything. Even new releases are hard to find. I was told that they only order a certain amount when they first come out, so if they go, they're gone until they order again and tough luck if you come in looking for one. The romance section is packed - five aisles. The problem is, the shelves are packed because they have four or five copies of the same book on it (and they're usually old releases). Our smaller indie shops are very specialized and don't appeal to what I read anymore, so I can't shop there either. Amazon is it for me, especially with my Prime membership and my Kindle and I'm not going to beat myself up over it. Since I live outside the US, the 98% of my shopping is done online, only in case of emergency I ask my cousin in TX to buy me books before she comes down for visits. She always takes me to B&N when I got to the States - I don't think there is a Borders near to where she lives - but I rarely buy anything. I love wandering up and down the store, and the people are super nice (last time, they looked for 15 minutes until they found a copy of this book my sister wanted to buy). But the long and short of it is that, well, it's pricer than Amazon. A lot pricer and I'm an starving college grad who is looking for a job. But I do love wandering there, I'm just not an impulse buyer and frankly, half the time I can't find new stuff or stuff that I desperately want to buy. I think I would love to buy in independent book stores if I had some available. In that case I would really be willing to pay for the higher price - I do it in daily life, supporting locally made things, organic, etc - but I somehow don't have it in me to pay more at B&N. If I'm buying from a big store, I rather do it in Amazon. I live in Australia and here we don't get free Amazon shipping. So more often than no it costs more online than it does at Borders. That being said there is alway the Book Depository! I, for one, support my local independent bookseller and only use Amazon, Borders, etc. if I have a giftcard. I do this because even though it's more expensive, the money (taxes) is staying in my community. Also, part of the reason books are so expensive in stores is because of big distributors like Amazon selling them so cheaply. It makes it more expensive for other booksellers, and ultimately, for the consumer. Personally, I choose to not support Amazon or chain bookstores, but I certainly don't judge those who do. I think it's important for people to read and have access to books - while I would love for everyone to have an indie store they can afford to support, I'm just glad people are buying books period. I always go to bookstores--I prefer holding a book in my hands, thumbing through it and then taking it to the cash register so I can buy it. I've never ordered a book online (for myself, at least) but I know that sometimes it's easier and cheaper. I can't say anything about e-books since I've never actually read one but I can't imagine a world without books or bookstores. Maybe Borders will regain its footing in the future; who knows? I'm in the same boat as you. I go to my Borders a lot, but only when I get a good coupon. Amazon is where I get most of my books, especially since I have a Kindle and would rather buy an ebook than a paperback. I usually get my hardcovers (which are what I prefer) from Borders with a coupon, but if it's a preorder or a larger purchase then I usually go for Amazon. Like you, my main reason for shopping Amazon more often is pricing. I can't afford to spend $18 on a book that I can get for $11, especially when I buy them by the armful. My Borders is one of the ones that is staying open, so I hope that my buying books there on occasion has helped and will continue to help keep it that way. The way I see it is this - we bloggers read more and buy more books than your average person, and maybe also more than your average reader. So if 1/5 of our books are purchased at Borders, that's still a good chunk of business for them. I get most of my books from Borders, Half Price Books, or somewhere like that. But Amazon runs a very close second. Mostly because I have a Kindle and get books for that. I wouldn't worry too much about bookstores going away completely. That just won't happen. I have done research and, if anything, bigger chains like Borders having to make cut backs in their huge corporations, will boost smaller bookstore sales. The little 'Mom and Pop' bookstores are supposed to make a comeback, which would be awesome. Even if they don't I just don't see chain bookstores going away for good. Too many people do still go to them. Like you, I hate hearing about any business in my community closing, independent or chain store, people are still losing jobs. Having been recently been laid off myself, I know the feeling. Since we are now down to one income, the budget is tight. I get my books from the library and thankfully, we have an excellent library system. Yeah, I'm an Amazon fan myself. I love that free two-day shipping and the price is nice. I do frequent The King's English when I'm in the area and there's a B&N close by that I probably go to at least once a month, but the last time I was in a Boarders was three years ago when Breaking Dawn came out. It is sad they've gone bankrupt. If there was a Boarders closer to where I might try to go.